I have worked in my current career for the past 23 years. In those 23 years I have moved across the country because of it, worked for 3 different companies, survived mergers, buyouts, renaming, rebranding and pretty much every other hurdle that the business world has to offer. For the first time in my career I was let go due to downsizing and restructuring. Suddenly one Tuesday afternoon I found myself unemployed. I have been working since I was 14 (other than that unfortunate period in my early 20’s, but we don’t talk about the ‘90s anymore), so this is very unfamiliar territory. Once I got over the initial shock, I was able to sit back and assess the situation. Taking stock things didn’t look so bad. I have great marketable skills. I’m very good at what I do. I have a wonderful family and we are all healthy and happy. We have a house, a car and some savings. We could manage this unexpected curve ball. I took a week to let myself feel all the emotions and think all the thoughts. I looked at what jobs were currently available in the city. I started networking with friends, putting out feelers to everyone I could. And then I started exploring other ideas. What if I changed careers? At 47, with my family dependent on me, this was a pretty far-out there idea. But the idea started to grow. What else could I do? Did I want to keep doing what I’ve been doing for the next 20 some odd years? Could we even entertain the idea of starting over in something new? Having a loving and supportive partner makes all the difference in the world. I would not have gotten through this past week without Hilary. She’s my rock, my sounding board, my shoulder to cry on, my support in all things. We talked through all the possibilities and ideas, coming back to some frequently, dismissing some immediately, shelving some for future consideration. We talked about every aspect that we could think off; financial risks, what the time away from family various ideas would mean, what our day to day life would look like, and any impact to Liam. And together we have come up with a plan. I am going back to school and embarking on a new career path. The new career path is not so far off from what I’ve done in the past that I can’t take all of my skills and experience with me. 23 years of experience is not something you just toss away. But it is new and different. I will be doing things I’ve never done before, alongside things that are familiar to me. The course I will be taking is 14 months long. I haven’t been in school since 1989. That was a very long time ago. It is a very scary prospect to walk into a classroom at this stage of my life, but it is the means to an end, and I will give it my all. This was never something that I would have dreamt of doing on my own. But when life gives you lemons, make the best, sweetest lemonade that you can! This past summer Liam expressed interest in finding out more about his ancestral background, so we ordered 2 DNA testing kits - one for him and one for myself. As the adoptees of the family, we felt this would be fun to do together; Hilary can trace her ancestry back pretty far, and when you see pictures of her with various relatives, there is little doubt that they are all genetically related. I finally got a picture of my birth mother Iris and my half sister when I was in my 30's. I poured over every pixel looking for a resemblance. I was very disappointed to not find much. Even Iris said that she didn't see any resemblance in us, but did offer up the nugget of information that she though I looked like I took after my father's side. Unfortunately that was about as much information as she was willing to tell my about my birth father. With the easy availability of DNA testing kits today, it seemed like a great idea as an adoptee to possibly fill in some missing information. I knew the information would be quite generalized, a list of potential percentages from different areas of the world, but it was still more information than I had before. What I didn't anticipate was some of the emotions that doing this would unearth. When the kits first arrived in the mail it took me over a month just to be able to open it and read the instructions. From there it took another couple of weeks to work my way up to actually registering the kit online, spitting into the little tube and mailing it in for analysis. Once it was mailed off I was able to bury the thoughts of it in an "out of sight, out of mind" kind of way. Until the email came telling me that it was ready. I had chosen to do our tests through Ancestry.com Part of the decision was price, part was based on the other main stream test being geared more towards testing your DNA for potential medical issues and partly because Ancestry.com includes family tree software. I knew going into this that one of the possible outcomes of having your DNA tested was being connected to someone who you were genetically related to that had also been tested. The media has been full of stories of best friends finding out they are actually siblings and other adoption-reunion situations. Of course in the deepest recess of my mind I held out a smidge of hope that I might become one of those stories. I already knew that I have 5 half-siblings, and potentially any number of cousins, aunts or uncles. No big surprises there. Iris had given me some indication of where her family was from, so I fully expected Western European and British. I very quickly moved on to the next section. Here were real people, with pictures(!) that I was potentially related to. My closest match was a 1st cousin. The Ancestry.com website has a message option that you can reach out to people that you have potential matches with so that you can connect and discover exactly how you may be related. By this point I was all in, so I quickly put together an email about who I was and how we may be related and sent it off to 7 possible 1st cousins. Within hours I had heard back from someone. I had enough identifying information about my birth family to confirm our connection. Overall I have had contact with 3 of my cousins, one from my birth mother's side, and two from my birth father's. Since then I have had many emails back and forth, one phone call, been sent dozens of pictures (including a picture of my half-siblings on my father's side) and heard stories about my birth father and his family. I was also able to find out that my birth and adoption was not the well kept secret that Iris had thought it was. Rumours and stories of my existence have made the rounds of all the family functions. It has definitely been an emotional roller coaster, but I've learned over the years that most things associated with adoption are. I'm so glad for the information and connections that I have from doing the DNA test, and it may open many other doors yet. 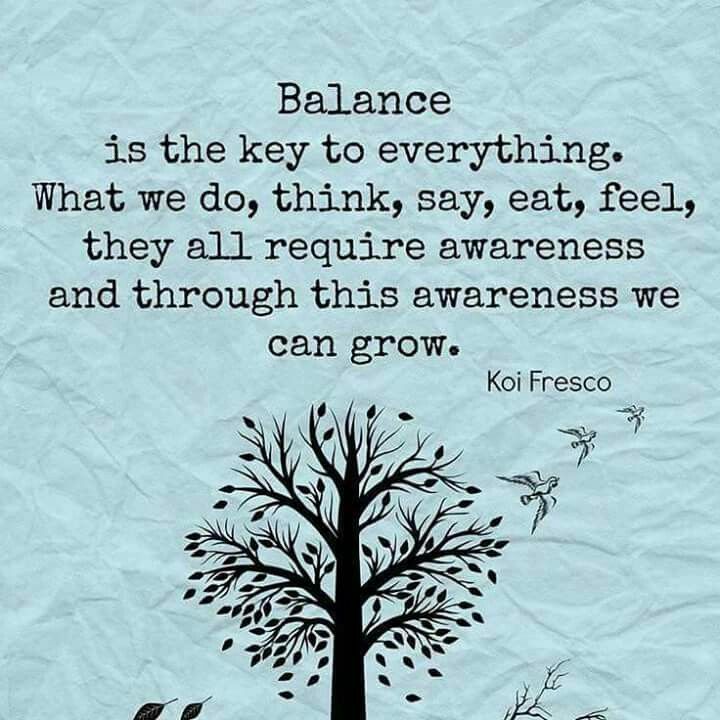 My word for 2018 is BALANCE. 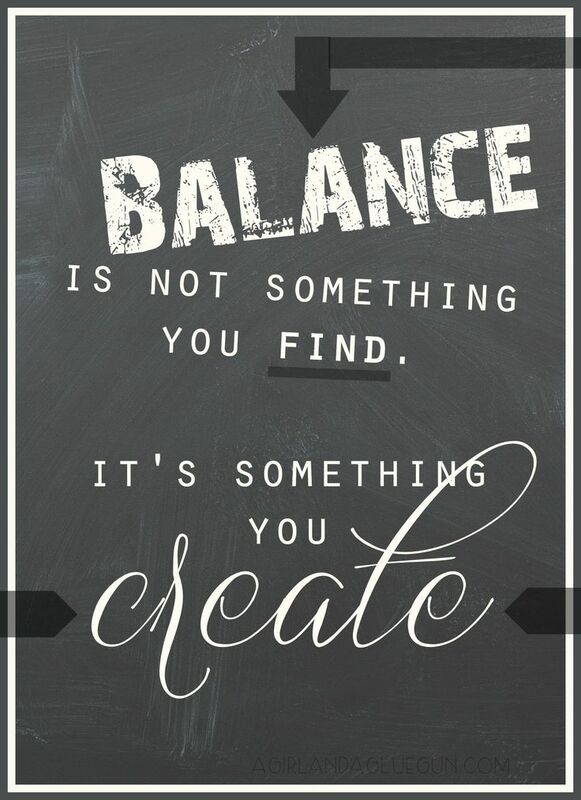 I see BALANCE being important in many aspects of my life. I have the advantage of being able to work from home for the most part, so this really helps to balance my work and home life. I still need to ensure that I don’t let myself get caught up in working too late just to finish something. I also need to make sure that I am disciplined enough to be focused and working during work hours. There are also changes coming in January to our lives that will make BALANCING work and home life even more significant. Thinking outside the box and redefining how home life looks and runs will be key. Being healthy continues to be important to me. I am a strong believer though that getting healthy is not going to happen with a quick fix or a diet, it is a lifestyle change that I need to embrace. That makes balancing good and bad food important. I am not willing to completely cut out any one food from my life, but am willing to BALANCE the good with the bad. I will be training for 2 half-marathons in 2018. One in June and one in September. My training plan is about 16 weeks, so training will officially start in February. Once my mileage starts to ramp up my long runs start taking over 3 hours on a Sunday morning. Much like balancing work and home life, I do not want my training time to take over all of my free time, so finding a BALANCE in my training schedule to still have non-training down time is essential. I will find and create BALANCE in all aspects of my life for 2018. When I selected STRONG as my word of the year for 2017, I wasn't 100% sure what STRONG would look like for me. I want to be strong in my resolve. I want to be strong in my convictions. I want to be strong in my relationships. I want to be strong for my family and friends. I want to be mentally strong. And yes… I want to be physically strong too. Now that the year is coming to a close, I can say with confidence that I am STRONGER than I was when the year began. My relationship with my Mom is STRONG. Mom and I spent a week long vacation just the two of us in the spring that culminated in our doing a half-marathon together. Crossing the finish line hand in hand was a great moment for both of us. My relationship with Liam is STRONG. Having a great open relationship with him at 15 is so important to me. I'm glad that we can talk about anything, even if there are times that he isn't so pleased about the topic choices! Hilary and I continue to have a STRONG relationship. We celebrated 24 years together yesterday. We have managed big moves, buying houses, having a kid, illnesses, career changes and pretty much everything else that life has to offer. All of it just makes us STRONGER together. I am mentally STRONG. I try to challenge myself both at work and at home, to keep my mind active. Don't get me wrong, there is a good amount of time spent on mindless pursuits as well, but I think that recharging is just as important. I am physically STRONGER too. 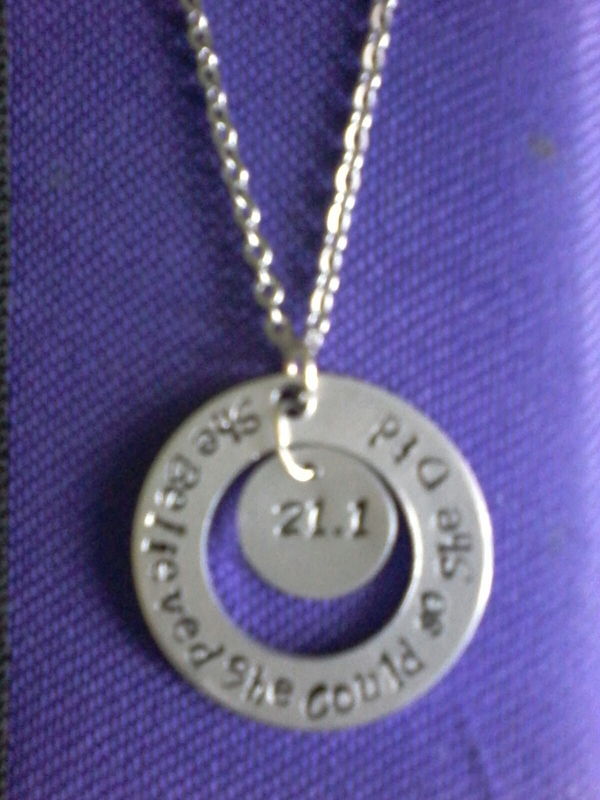 I completed two half-marathons this year and many other races as part of my training. I joined a gym to work on strength training to help keep me injury free. I can lift heavier weights now than I could a year ago. One day soon I might even be able to do a push-up. 2017 was a great year overall. Thank you to all my friends and family who helped me be STRONG. I always thought of running as a solitary sport, not something that you did with others. Boy was I wrong. 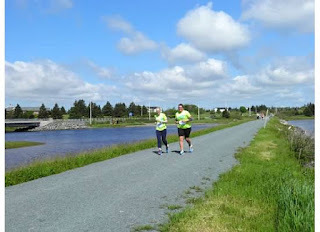 When I first started running, I did a learn to run program and made my first running friend. Sheila could have run faster then me, but stuck with me every week. We then ran our first 5k together. 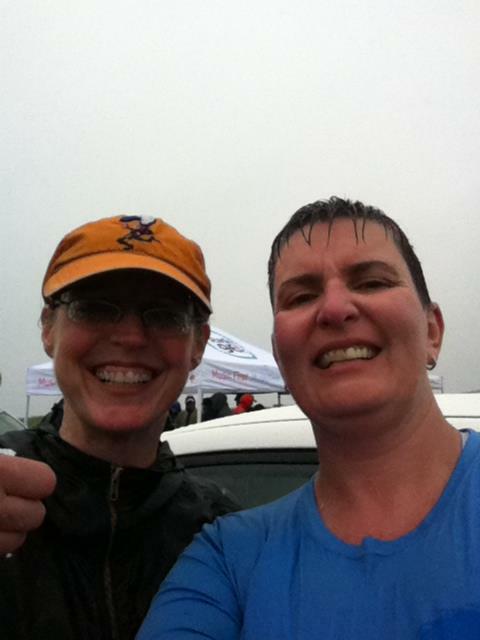 When I decided to train for my first 10k, my friend Donzella offered to train with me and ran the 10k race in a torrential downpour, getting me over the finish line long after I was ready to give up. Since then I have made so many more running friends. Friends who run in the rain with me; friends who wake up before the sun so that we can drive to races together; friends who join me at the track on a Sunday morning while I run 50+ laps. Friends who finish their race and double back to help me cross the finish line. Friends who are always at the finish line to cheer me on. Friends who give me a gift to remind me every day that I should believe in myself. Friends who believe in me. As part of his birthday gift this year, my Mom sponsored a donkey in Liam's name at a farm near her that rescues donkey's and cares for them. The Donkey Sanctuary has over 60 donkeys, and opens their doors twice a week for the public to go and visit them, so we got to visit Flint in person. 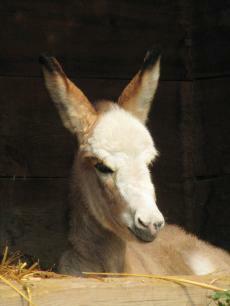 Flint was born on the sanctuary on July 20th, 2014. They don't breed the donkeys in their care but Flint's Mom Diamond was pregnant when she was rescued. He's a fiesty little guy that likes to eat the other donkey's harnesses when he's out in the field with them. Liam is an avid animal lover, so adding a donkey to his list of creatures was a great birthday gift and he can't wait to go back to visit Flint again next summer. In 2017 I will be STRONG. When I think of the word strong, my first thought always goes to “physically strong”. And I don’t think of myself as being physically strong. I need Hilary to open most jars, Liam to carry heavy things down the stairs and I couldn’t do a push up or a pull up to save my life. But strong can mean so much more. I want to be strong in my resolve. I want to be strong in my convictions. I want to be strong in my relationships. I want to be strong for my family and friends. I want to be mentally strong. And yes… I want to be physically strong too. In 2017 I am going to focus on being strong. I don’t know how that will look, or what the end result will be. But I do know that I will be a stronger person in the end.